IIEP is pleased to announce the publication of its new book Internal Quality Assurance: Enhancing higher education quality and graduate employability. It marks the culmination of a major international study on exploring effective and innovative options in internal quality assurance. Amid widespread diversification, growth, and privatization in higher education worldwide, questions over quality and graduate employability have surged to the forefront. In many parts of the world, this situation has led to the development of external quality assurance (EQA) in higher education, such as accreditation and quality audits. While external drivers initially provided the impetus for internal quality assurance (IQA), a growing number of institutions are setting up IQA to keep the quality and relevance of their programmes in check. The orientations and different tools and processes related to IQA are vast. Furthermore, these systems involve a range of personnel – from administration, teachers, to students – in the university community. For some universities, this means entering into unchartered territory when developing or refining an existing IQA structure. 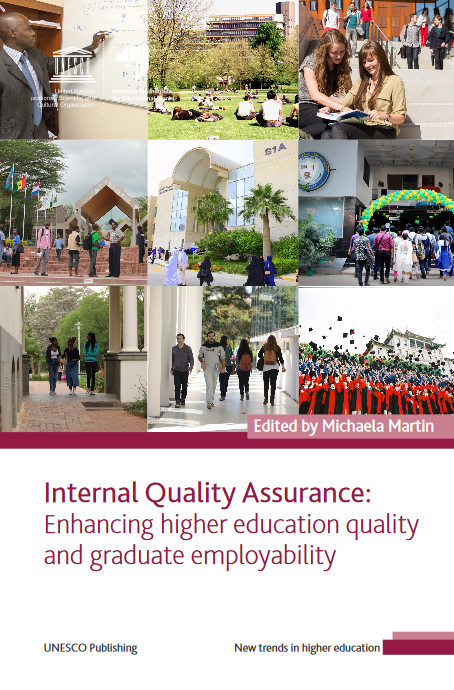 In this context, IIEP is pleased to announce the publication of its new book Internal Quality Assurance: Enhancing higher education quality and graduate employability. Edited by IIEP’s Michaela Martin, it presents the international trends in IQA today, including innovative practices and principles. Its overall aim is to serve as a guide for higher education institutions planning to design and develop their own IQA systems. Findings from a major international survey, conducted with the International Association of Universities (IAU), gives the book a comparative perspective of international trends. The book also draws from eight in-depth case studies from Austria, Bahrain, Bangladesh, Chile, China, Germany, Kenya, and South Africa. It offers a comparative analysis of best practices used by these universities, and thus becomes a source of inspiration for those involved in designing and reforming IQA in higher education. The book provides useful guidance for national and institutional policy-makers and quality assurance officials. Its conclusions emphasize the need for flexible, qualitative tools for IQA that function alongside quantitative tools. Universities should also strike a balance between academic- and employability-related IQA tools, and evidence-based dialogue on quality assurance must take place amongst all university stakeholders. While this book is global in perspective, it also makes sure to respect the key fact that all IQA systems will take on different forms and meanings based on their own context and place.